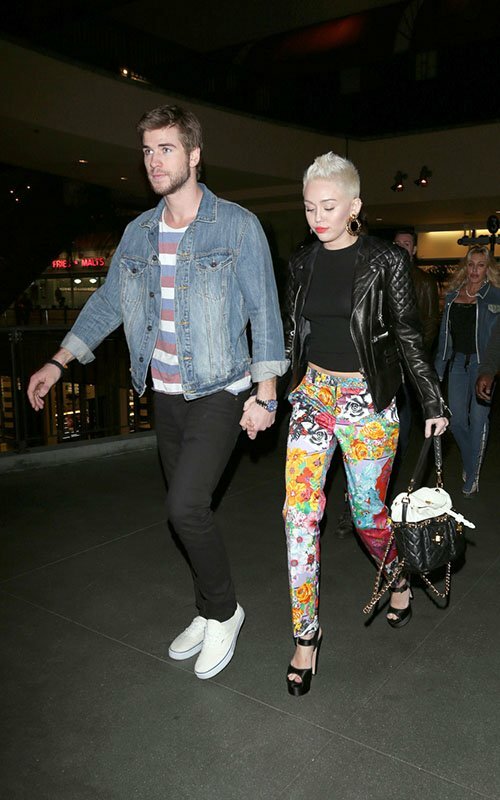 Miley Cyrus was spotted hand-in-hand with her incredibly handsome fiancé Liam Hemsworth at Level 3 Nightclub in Hollywood, celebrating the birthday of her little sister. She went bold in a Balenciaga Quilted Leather Jacket, black t-shirt, Vintage Versace Floral Skinny Pants, and satin platform sandals. She tried something new in the beauty department with gold doorknockers and coral lips. I’m loving this look! Her lambskin leather jacket features partially quilted sleeves, a diagonal front zip closure and zipper detailing. The black is sold-out, but the green is still available! Her vintage pants mix paisley and floral prints. Balenciaga’s Quilted Leather Jacket is on sale for $1606 and Versace’s Vintage Floral Skinny Pants retail for $695. Visit www.farfetch.com and www.shopbop.com to purchase.